I’m a worrier. I don’t know why, it probably it has something to do with anxiety or maybe it’s just the way I’m wired and part of what makes me who I am but it’s just something I do all the time. Every time I go anywhere I worry. I worry about myself, about my family, about my friends, about random people I don’t know. I saw this quote today and I wasn’t sure how I felt. I want to think that I can be both. I see it this way, worrying is a part of my nature that I can’t really change. I’m always going to think of the worst possible outcome in any situation and I don’t think that will ever change. This isn’t always a bad thing. Due to my worrier nature I like to think of myself as an asset rather than a hinderance. While I’m sure I can be a nuisance in some social situations in which people want to have some reckless fun and I of course have to be the voice of reason, but in other situations I’m sure it’s a good thing that I’m the voice of reason. I believe that everyone needs a voice of reason whether they think so or not. I worry whenever anyone leaves the house that they won’t come back. I worry about my friends drinking too much and not realizing it, then not getting to the hospital in time. I worry that I’m going to go blind every time the little black spot shows up. I worry that I’m going end up back in Lancaster post graduation. I worry that people I love are going to forget about me. I worry that I’m going to forget about someone important. I worry that I’m going to fail every time I try something new. Yet, no matter how much I worry it’s not as bad as I think it’s going to be *knocks on wood* (a worrier’s worst and most frequent habit). Worrying prepares me for the worst but I like to still expect the best. It’s just how my brain works and I don’t know why I had to write all about it. I guess it’s that just because I worry about every little thing it doesn’t prevent me from doing things. It doesn’t make me any less of a person, it just means that I put a little more thought into things before I do them. 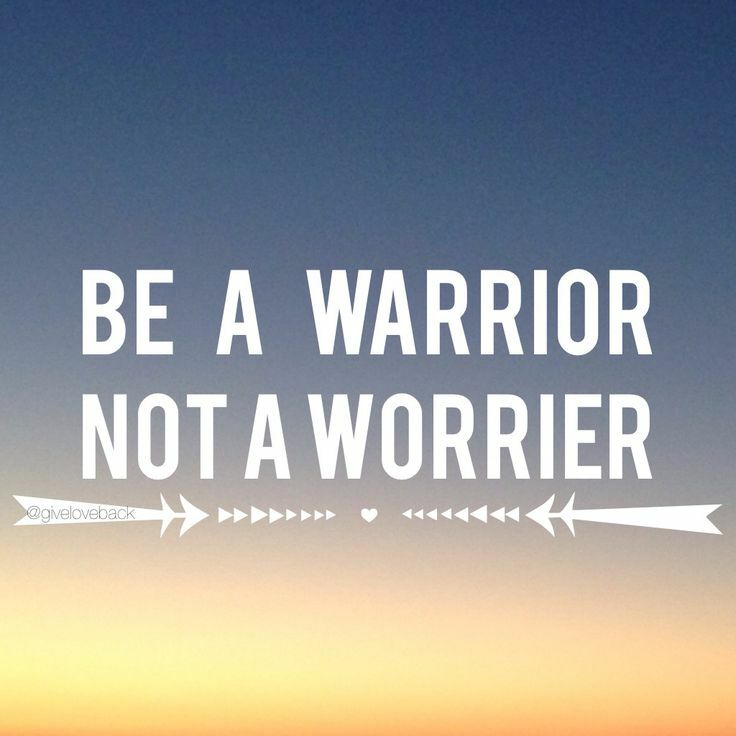 You can be both, a worrier and a warrior, you don’t have to choose.